For many, a drink symbolises a celebration – be it of achievement, jubilation, or simply the need to express happiness because the discerning gent wants to. Whatever the catalyst to celebration, the tipple you celebrate with is often the mark of a man. With celebration in mind, Elysium Magazine would like to welcome to the drinks cabinet of the discerning gent Jura Whisky One And All. This limited edition tipple is a celebratory 20-year-old single malt whisky that hails from the remote – but beautiful – island of Jura just off the West Coast of Scotland where the Jura distillery is based. With only 200 people inhabiting the island and being heavily outnumbered by more than 5,000 red deer that roam the vast planes, it is a sight of beautiful wilderness. Being the sparsely populated island that Jura is, everyone knows each other and by default, everyone gets on with one another too. Some context for illustration: Jura only has one road, one pub and one distillery on the island. The distillery wanted to capture this essence and in February this year, the distillery team got together to pick this year’s limited edition bottling, giving way to the One And All. Matured in American white oak ex-bourbon barrels and specially prepared with Jura aged in Sherry wood, sparkling Cabernet Franc casks, Cabernet Sauvignon casks and Pinot Noir barriques gives you an idea of the level of craftsmanship and time required to get this whisky to where it is. The result is full of impact. On the nose you’re hit with tropical fruits, toffee, ginger and honey. It gets deeper on the palate as notes of black Morello cherries, maple syrup and white chocolate develop on the tongue with a lingering finish. It’s the kind of whisky the discerning drinker would want for a celebration. 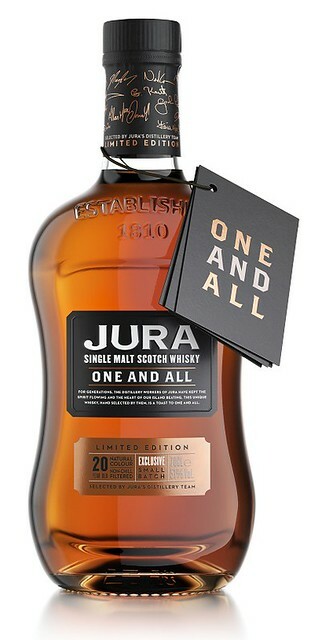 Jura Whisky One And All is 51% ABV and is bottled at 70cl. It is available from all good drinks retailers, RRP £120.